Like raindrops streaking across the windows of your car while you drive through a rainstorm, water droplets in clouds travel in airflow streamlines — following currents of air usually without touching. However, the air inside clouds tends to be turbulent, as any nervous flier can attest to, and swirling turbulent air causes droplets to cluster. For 20 years, atmospheric scientists have conjectured that water droplets do indeed cluster inside clouds, largely owing to the knowledge that turbulent airflows are full of spinning vortices that mix fluids well. But clouds swirl on such vast scales, that doubts persisted whether the turbulence simulated by a computer or generated in a laboratory could be translated to the atmosphere. A team of atmospheric science researchers have taken instruments to the atmosphere itself, and have confirmed that water droplets do indeed cluster together inside clouds. The article, “Fine-Scale Droplet Clustering in Atmospheric Clouds: 3D Radial Distribution Function from Airborne Digital Holography” was published in November in the journal Physical Review Letters (DOI: https://doi.org/10.1103/PhysRevLett.121.204501). To make this determination, the researchers took their experiments to the sky, using an airborne holographic instrument known as the HOLODEC, short for the holographic detector for clouds. 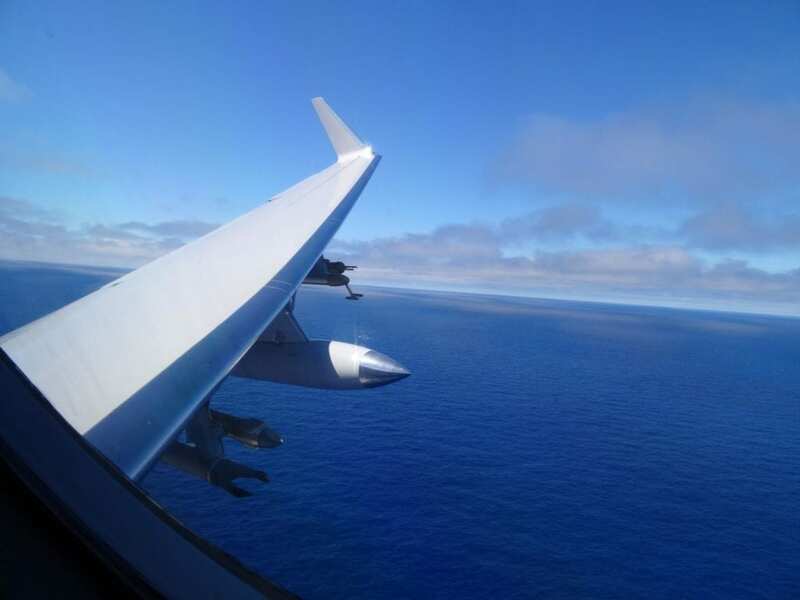 The instrument is fixed under the wing of Gulfstream-V High-performance Instrumented Airborne Platform for Environmental Research aircraft operated by the National Center for Atmospheric Research (NCAR) and the National Science Foundation (NSF). The HOLODEC resembles a claw, its prongs can record three-dimensional images to capture the shape, size and spatial position of everything that passes between. “The clustering signal that we observed is really small, so as is often the case in science, a careful analysis had to be performed to detect a small signal and to convince ourselves that it was real,” said Raymond Shaw, professor of physics and director of the atmospheric sciences doctoral program. Susanne Glienke, who was a visiting doctoral researcher at Michigan Tech from the Max-Planck Institute for Chemistry and the Johannes Gutenberg-University in Mainz, Germany, conducted the data collection and holographic image analysis. She then passed the information to Mike Larsen, associate professor at the College of Charleston and Michigan Tech alumnus, who looked at how tightly droplets cluster by calculating the probability of finding two droplets spaced apart at a specific distance compared to the probability of finding them at the same distance in a randomly distributed setting. He determined droplet clustering becomes more pronounced at smaller particle-to-particle distances. Glienke notes that knowing about clustering improves the general knowledge of clouds and can lead to improvements in forecasting the behavior of the clouds: When will they rain? How long will the clouds last? Additionally, apart from influencing rain, clustering also decreases cloud lifetime. If a cloud dissipates quicker, it has a smaller influence on the radiation budget — and influences global climate, if many clouds are involved. The experiment required a long continuous sample, flying the plane through stratocumulus cloud decks at a constant altitude. Marine clouds behave differently from clouds over land. Continental clouds typically have smaller droplets, due to more abundant cloud condensation nuclei, which are needed for water to condense on. Continental clouds, which are typically more turbulent, are more likely to have clustered droplets. Because the clouds examined in the study were not particularly turbulent, which meant that a random distribution of droplets was more likely, it made the presence of clustered droplets all the more important. Shaw notes that this validation is important to the field of atmospheric science because the detected clustering signal is consistent with concepts developed during the past two decades, based on lab and theoretical work. The work shows there is still much to be learned about clouds and their effects on the planet.